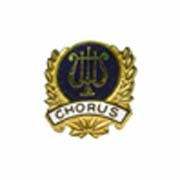 Chorus Award Pin with Presentation Box. This pin features a gold-plated laurel surrounding a deep blue enamel circle. Within the circle is a gold-plated music lyre. Set against that background, the word "Chorus" is goldplated within an enamel crescent of white.